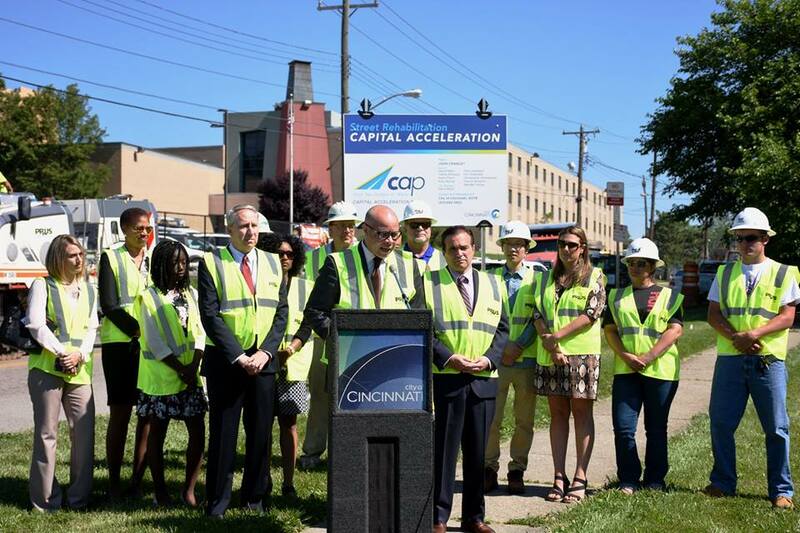 On Thursday, the City of Cincinnati celebrated the start of its bold, new road rehabilitation effort. The six-year program will include the resurfacing and rehabilitation of aging streets, replacement of city vehicles outside of their life cycle, and establish a new focus on preventive road maintenance that city officials will save money in the long-run. The $109 million Capital Acceleration Plan is a strategic policy shift at City Hall, and represents a large infusion of money into road repair. The new focus on preventive maintenance is particularly noticeable as it represents an eight-fold increase in spending on that front. City officials say that the investments will improve the condition of 940 center-line miles of streets over the next six years. In its first year, its $10.6 million for street rehabilitation and $4 million for preventive maintenance, officials say, will impact 16 different neighborhoods and improve 120 center-line miles of roads. With so many streets poised to be improved over the coming years, many people advocating for safer bicycling and walking conditions on the city’s roadways were optimistic that across-the-board improvements could be made. In fact, their cause for optimism is not without cause. The City of Cincinnati’s Bicycle Transportation Plan, which was adopted by City Council in June 2010, calls for incremental improvements to the city’s bike network as road resurfacing projects take place. According to officials at the Department of Transportation & Engineering, such savings can be achieved since the capital costs can be shared for both sets of improvements, and labor costs can be maximized. City Hall, however, has fallen woefully behind on the implementation of the recommendations made in the Bicycle Transportation Plan; and the current administration has even made a point of noting that they do not generally support the idea of on-street bike facilities. Rather, Mayor John Cranley (D) and his administration have focused on investing in off-street recreational bike trails. Such an approach has left many people who use bikes as a means of transportation frustrated; and with $69 million of CAP going toward road improvement projects, it would seem like a great opportunity to maximize the improvements by performing these projects in a manner that also improves safety conditions for the city’s rapidly growing number of people commuting by bike. Based on statements from City Hall, however, it seems that it will prove more so to be an opportunity lost; and put the city in an impossible position to meet its adopted policy objectives within their target time frames.